Details. The little things that aren’t core to a game’s design or mission, that a game could ship without, they are often what gets cut when budgets and deadlines start to loom. But details can make or break a game;details can be the difference between success and failure, fun and boring, engaging and shallow. They can add spice and variety reward inquisitive players, and perhaps most importantly, let the lore and world you’ve created hold up under closer scrutiny. Today we’re going to look at one such detail: designing an alien alphabet for your game. Way back in 1990, when the 8-bit era was on its way out, Id Software gave unto the world Commander Keen. Designer Tom Hall created some simple signs for exits, weapon locations and so on. At first he just altered the English letters to make them a bit more alien-looking but the end result was the Standard Galactic Alphabet. Alphabet is the important word here – being a simple substitution cipher it doesn’t class as a new language, but it did the job admirably. There are likely earlier examples of alien alphabets in games, but the SGA is perhaps the best known, if not by that name – it is also used in Minecraft’s enchanting tables, though the translation there is slightly less meaningful. Fast forward 25 years to the age of AAA games, massive studios and technologies that could barely be imagined in the age of the NES. Games have art budgets that can cow small countries, and it’s practically a given that a game featuring alien or fantasy races will have one or even several new alphabets on display. However, not everyone can afford to employ a Tolkien to come up with a whole system or written and spoken language for them, so how do you go about creating that Deimosian script? 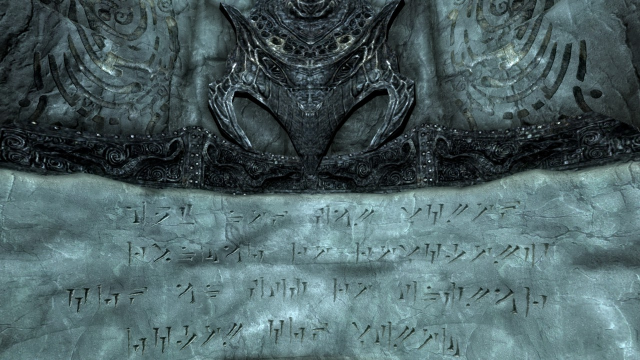 Skyrim gave us Dovazhul, the language of the Dragons, as written by foot-long claws. Dave Bleja wrote a great piece about the process he went through to design an alphabet for Spryke. Written language is everywhere, and is a key component of culture (even its absence in oral cultures is a key component of those). If you want your world to feel like it has its own living, breathing culture, then you need to think about its written language. A little more playful is this article by Zach barth on the creation of the alien script in Infinifactory. The square form of the letters fit the game’s obsession with cube-shaped objects, and the strokes implied enough variation that it could conceivably encode enough information to be part of a viable script. Or: where did this this alphabet come from? How did it evolve? As we saw above, the Dovazhul script is hard and savage, a direct result of being primarily carved (see also ancient Roman lettering, as carved in stone, and Klingon and Predator letters). Is it a language designed to be decorative or functional? Expressive or economical? The history and nature of the race you’re designing for will have a direct impact on the design you chose, and your players will notice very quickly – though maybe not consciously – if there’s a mismatch. The text in Infinifactory is meaningless, just random letters and numbers given structure. On the other hand the signs in Commander Keen had actual translations, and there are translations of Dovazhul. It might be for aesthetic reasons, depth of lore, or even gameplay mechanics, but if you want to translate a human language into your new alphabet there are other considerations to think about. First off, little things – certain combinations will appear more often than others. It’s worth checking that they look good, especially doubles. Hey, if you’re going for this level of detail, you may as well go all the way. Secondly, and more importantly, if your language is intentionally translatable, make it legible and free from too many ambiguities (I’m looking at you, Roman alphabet). Only do uppercase/lowercase if you have a really good reason for it, as it’ll double your workload. Many real-world alphabets only have one case. This is especially true if you’re using translation as a gameplay aspect such as puzzles – increasing the scope of your alphabet increases the challenge. Make sure you’re keeping a balance between difficulty and realism. If the alphabet is primarily to depth and colour to your world, it might be worth investing in some variations. Coming up with the base alphabet is the hard work; now you can build on that by coming up with some variations on it for use in different contexts. Signs, hand-writing, advertising, mechanical, the list goes on. There are plenty of things you can do to help your players get familiar with your language. Even if it isn’t a requirement for gameplay they’ll feel good about it, and you’ll feel good that they picked up on it. It’s the places you might not first think of that really make the difference. How about the ammo readout on an alien weapon? Your players will learn the numbers the hard way and get a concrete benefit for doing so. Colour-coding and distinctive punctuation can be a good guide too. For example, early on, you could make warning signs very obvious through use of colour and attached symbols, and then later on have a trap signposted with just the word scrawled nearby, giving observant players a chance to avoid it and yes, feel good about it. If you have the resources and/or the imagination, having more than one language can seriously add to your world-building. Got a transport hub or tourist attraction? Signs in multiple languages, just like in the real world, tell the player that this is a place where people/races rub shoulders. Or maybe you want to show societal conflict? Street posters in one language, vandalised in another. When a player can tell something about the area writing they see on entering, you know you’ve won. …humans are pretty good at language. Big portions of our brains are given over to it. Writing is one of the hallmarks of civilization and without it you’d probably not be reading this on your modern marvel of engineering. If you’re going to put a new alphabet in your game, do it right and use it as a means to not only add some flavour to your game but as an opportunity to draw your players in. And if they ignore all your work? 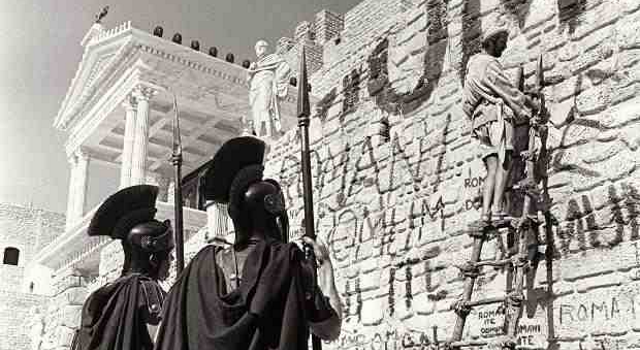 Well, you get the last laugh as they stroll past the warning sign and plunge into the pit of starving battle-weasels.